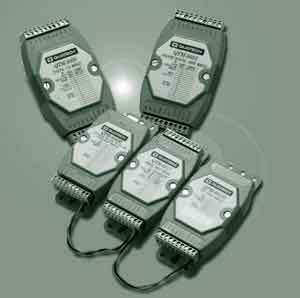 Quatech, Inc.mote data acquisition and signal conditioning modules condition and protect a range of industrial control signals in RS-232 or RS-485 serial networks. Modules sample data from RTDs, thermocouples, and transmitters. Operating at speeds to 115 kbits/second, these modules can be wall- or DIN rail-mounted. DOS or Windows-based data acquisition software, and a custom config utility is included. A QTM-8520 model converts RS-485 to RS-232 levels. Converter and repeater modules include a Self Tuner ASIC which can auto-tune baud rates, data formats, and communication line direction. Up to 2,048 analog and digital I/O modules with different baud rates can be configured and monitored over a single port. Modules are supported by a command set that's backward compatible with ADAM, Nudam, and Analog Devices 6B modules. Price ranges from $99 to $239 per module (at time of publication). , 662 Wolf Ledges Pkwy., Akron, OH 44311. Phone: 800-553-1170; Fax: 330-434-1409.